[MUSIC PLAYING] THEME SONG: It's "Secret Golf." It's what I'm looking for. It's why I get up every morning, call my good-timing friends. Keeps me coming back for more. "Secret Golf," we're headed down the road. We just load it up, big show, going looking for the [INAUDIBLE]. Roll until the wheels fall off. It's "Secret Golf." Shh. It's a secret. DIANE: Welcome to another "Secret Golf" podcast with Elk and Knoxy. It's the week of the girls. The Solheim Cup is here, the action kicks off on Friday, and the excitement is definitely, definitely building. I'm Diane, or Knoxy. And Elk's going to be here a little bit later on in this podcast, joined by a very special guest. I will tell you who shortly, but we are going behind the scenes at Des Moines Golf and Country Club in Iowa, the course that is hosting the 15th contest of the Solheim Cup this week. Now, if you missed our previous podcast that we did, we put out the beginning of the week and we're actually joined by two of the American team, Brittany Lang, former US open champion, and Gerina Piller. Now, Gerina, Brittany, and Stacy Lewis, who is also part of the US team, one of the most experienced on the team, definitely, they are all signed to "Secret Golf." And if you go on our website, secretgolf.com right now, you can find out in detail in depth about the game of Britney and of Stacy. Gerina's player channel is going to be coming very soon. So as I said, 15th Solheim Cup this week Des Moines Golf and Country Club, and it all kicks off on Friday. The Americans, well, of course, they want to retain the title they won in Germany in 2015. But the Europeans definitely want to take it back. In 2015, it all came down to the final day, not only the final day, but the final match. Entering the Sunday, the European team were leading 10 to 6 and only needed 10 points to retain the cup. Singles matches, anything can happen. 12 matches, and the United States won eight, meaning that they had 14 and a half points, and the Europeans 13 and a half. It was one of the most dramatic comebacks that golf has ever seen. And it was our very own very Gerina Piller, who was responsible for claiming the point that won it for the Americans. She made this incredible putt on 17 to take it to the 18th hole, where she won again. Now, the thing is, that footage, that putt has been shown over, and over, and over again. Gerina is bound to have seen it 100 times this week. So we'll see what that's going to do for her heading into this Solheim Cup. We actually-- when we show her player channel, she spoke about it. And she just said that it was a defining moment for her and in her life. And she actually keeps the scorecard booklet in her bag, uses that all the time. And she said that she will only ever replace it when she plays in another Solheim Cup. But I'm guessing the memories of 2015 are going to go down in the history books for her. Hey, let's see what's going to happen this year. Anyway, now, the two captains, well, they have played against each other for years now. So that competition, that rivalry is definitely there. Annika Sorenstam for the Europeans, and Julie Inkster is the captain of the American team, the American team, who holds a nine to five advantage in the Solheim Cup so far. I've seen the pictures from Des Moines this week, and the setup of the course looks incredible. The buzz around is insane. Actually, so far, over 120,000 tickets have been sold, and that's just for starters. They are still selling fast. The atmosphere is going to be electric. I wish I was going to be there to watch, and sit on the fence as to who I was going to be cheering on. Well, I'm Scottish. So I guess my loyalties have to lie with the European team. But having worked with Brittany Lang, and Stacey, and Gerina, and the fact that they are signed to "Secret Golf," and the fact that I live in America, ah, I don't know. I'm just going to get quite comfy sitting on that fence for the weekend, I think. Now, Elk has got a great friendship with Stacey, and Brittany, and Gerina. And, of course, he is going to be cheering for the Americans this weekend. But also, he's good mates with Gerrod Chadwell. 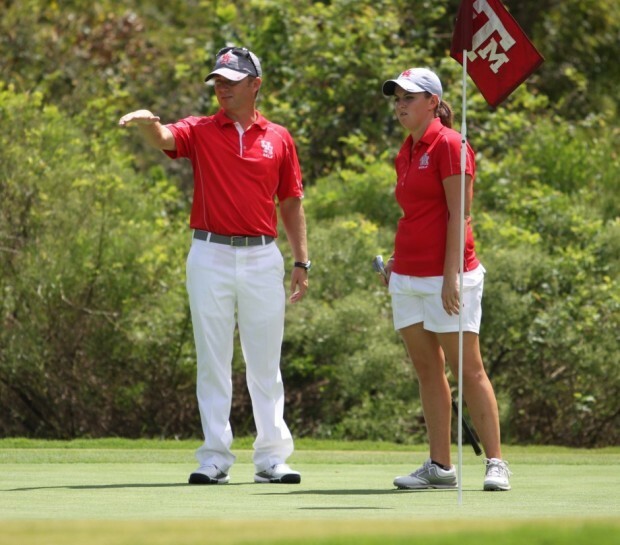 Now, Gerrod is the University of Houston women's head golf coach, and he's also the husband of Stacy Lewis. Elk is going to be chatting to Gerrod in just a little while. But first of all, before we hear their chat, there is a very interesting tactic that Julie Inkster is taking this week for the Solheim Cup. When it comes to her team, she is using the pod system. And this is something that Elk and Gerrod are going to be talking about a lot. Now, the pod system was used by Paul Azinger in the 2008 Ryder Cup at Valhalla in Louisville, Kentucky. What happened was he was captain, and he hadn't picked his captain picks yet, and he didn't really know what to do. So he was sitting on the coach watching a documentary about how the Navy turns their recruits into Navy SEALs, the ultimate fighting force, I guess. And what they said was that they would divide the big group into smaller, little groups, the core groups. So those guys would do everything together. They would eat together, sleep, train, they would get to the stage that they knew exactly what the other few people in their groups were thinking. So Paul Azinger was like, small groups, tight bond, and there's definitely something I can do to take that to the Ryder Cup. So that's exactly what he did. He got the guys together, and he split them into little teams. And they worked within those teams, or course, to go on to victory against Nick Faldo's European side. Julie Inkster has taken the same tactic for the Solheim Cup. So basically, she's taken the big team, and she split them into three teams of four based on their personalities, their work ethics, their traits, that kind of thing. There was a lot of testing that Gerrod will talk about with Elk. But this was not a straightforward of ah, they get on, they'll be fine, th-they're friends. No, they really, really delved into each individual golfer, and decided who was going to be best-suited to play in a little pod. So four people in each pod, and then they work with one of the vice captains. I was asking, what do they do about dinner? Do they all eat dinner together as a big team? And they do. But when it comes to work, and when it comes to being out on the course, those pods are working individually together. And that's how they will pick their playing partners from their little pods. It's very, very interesting. And Gerrod will tell you a lot more about it. This is Gerrod Chadwell, talking to Elk from Des Moines Country Club in Iowa. GERROD CHADWELL: Des Moines, Iowa? Looks mint. And they actually have 36 holes here. So they've got the junior Solheim Cup going on in 18-- a set of 18 holes. And they have this one going on in the other set. Yeah. They've used-- they've used-- like, the front nine is totally different than a back nine because the front nine's from one course and the back nine is from the other. GERROD CHADWELL: --down into like, a-- down to some short game areas. So I think it's good. That's-- that's probably where you're going to see a lot of things kind of get crazy is just around the greens, because the rough is growing, and greens are kind of slick and undulated. ELK: You said the course is going to be tough, right? It's-- birdies are going to win holes? GERROD CHADWELL: I think so. I think-- I think on the front nine, you're going to see a lot of birdies win holes, and on the back nine, I think you're going to see some crazy things happening. You're not going to see a lot of shots hit and stay. GERROD CHADWELL: I think-- I think, Elk, they kind of have based it off of these personality tests. GERROD CHADWELL: And they're not sure if that's how Ingrid did it as well. But you know, and it's kind of interesting to see being around a team, that it's so true. I think when it first started, I remember Stacy going-- maybe the team retreat out of quarter of all. And then they brought this lady in, and was kind of talking to them. And they had to fill out their personality test, or whatever they did on their own. But this lady asked this question. And you know, I think it was Stacy or somebody answered it. And Christie Kerr was like, you mean that's how you guys think? And so it's just kind of different in that it's golfers. And you can relate it to it too. It's just we process things differently. We players see shots differently, think differently. And based on this task, it's kind of split them up into three, four-people pods. And so they've kind of got their pairings an stuff that's easy to pair up out of that. ELK: So you- you- you- you told me already, but so in Stacy-- Stacy's pod, she has Gerina Piller Brittney Lincicome and Brittany Lang. GERROD CHADWELL: Brittany Lang. Mm-hm. Mm-hm. ELK: So will they all play-- they'll all play their combinations out of the pods? ELK: Yeah, they won both matches, right? GERROD CHADWELL: Mm-hm. Mm-hm. I think you'll see a lot of her, those two, and I think you'll probably see her and [INAUDIBLE] play some together. It seems like they do a really good alternate shot together, just kind of seeing them, their-- their play in the last two days. ELK: So do you have like a pod captain, one of the vice captains is the captain of the pod? GERROD CHADWELL: Wendy Ward is over Stacy's-- Stacy's group. GERROD CHADWELL: And then you've got Nancy's over-- forget which group Nancey's over. And then you have-- gosh, who am I missing? Pat Hurst is over [INAUDIBLE]. GERROD CHADWELL: Julie to kind of float a little bit, and then kind of do her thing, and kind of lean on him a little bit, which I think it's-- I think it's an unbelievable setup, the way they got it going. ELK: Well, yeah. You can come over and get the whole run of the-- run of the pod, basically, from one person, right? GERROD CHADWELL: From one person, from one person. And you take the-- you take the emotion out of it with the girls. You take everything out. And-- and you know, you've got three Hall of Famers there that you can just say, you know, this is what I see, this is what I think, and they go right with that. ELK: Is the that you'll be more successful with a one coach or one captain over four people, is that the theory? GERROD CHADWELL: I think so. I think so. That's the way-- that's the way I see it. And just the way they got them split up with personalities, no offense with just the women and stuff too, it just-- it makes total sense. ELK: I know Gerina Piller's a mathematician major, and I know Stacy Lewis is-- your wife is very regimented. So is this the reg-- is this the Army pod? Is this the military pod? ELK: That is. Then there's Lexi. Is Lexi-- is Lexi over there in, like, I'm just going to let it fly pod? Is that where she is? GERROD CHADWELL: Yeah, yeah, yeah, she's just in a grip it and rip it pod. She and-- her and Kerr have been great. They put Paula, who fits in that with them too with a lot of history. And they put Austin in with that group. So I think it's-- it's great. And then the funny thing was-- I guess I didn't hear it-- but they did [INAUDIBLE] with the press yesterday. And she called the other one the minority group. It was-- it was Michelle Wie, Daniel King, Angel Yin, and Lavet Falis. But she was joking around. She was like, well, they call themselves that. But I think when it came out, everybody was like, oh. ELK: The political correct group? GERROD CHADWELL: [INAUDIBLE], right. That's the way they think. Everything is calculated. It's genius the way they've got it figured out. ELK: Now-- now, historically, historically, this has been a very close match. What- what are you guys up against this week? What- what- what do you expect, and what do you-- what do you think's going to happen a little bit from the other team? GERROD CHADWELL: I think from the other team, I think they're going to let it rip, and let it all hang out. Like there's some-- there's some areas where you can drive it down in front of the green, get some short shots. Some of the girls just watched them play a practice round today. They're going to hear high birds or three woods. I think you're going to see the Europeans just let it rip. ELK: Are they a long-hitting team? GERROD CHADWELL: I think they're a long team. I think they're a long time. I mean, especially those couple of rookies, [INAUDIBLE], Emily Pedersen, I mean, they bomb it. So I would say from start to finish, on3 through 12, they're a long-hitting team. I think if they're not hitting it as well, I think the areas around that green could give them a little trouble because the rough is thick. It's very undulated, very fast greens. I think just probably in years past, I think that's probably what gets-- gives them a little fit. ELK: And of course, they have one of the great captains of all time as well, Annika Sorenstam. She-- she-- she doesn't miss a detail either. GERROD CHADWELL: Nope. Nope. She's not going to-- she's not going to hold-- there not going to be anybody holding back on that side. ELK: It's a very intriguing match, isn't it? GERROD CHADWELL: It's a Very intriguing match. And you got a lot of history with Julie, and Annika too, of playing against each other, going back and forth, and great competitors. I think it's going to be awesome. The build out-- wait til you see the build out on the first tee. It's unbelievable. ELK: Oh, I- I- I've been seeing it. I've been following LBGA. And I'm looking at-- it's like-- there's like-- it's like a bar scene right next to the one side of the tee. GERROD CHADWELL: You have the bleachers that kind of surround it back and side. And then on the other side, you have like SkyBox suites. GERROD CHADWELL: It looks like-- it's like a mini version of 17 at TPC around the team. GERROD CHADWELL: You got it. ELK: We might-- we'll check in with you again. But Thank you. Thank you, Gerrod. That's a great update, mate. GERROD CHADWELL: You got it. [INAUDIBLE] was good, Elk. Talk to you soon. DIANE: So that was Gerrod Chadwell talking to Elk live from the venue of the Solheim Cup, which kicks off on Friday. Really interesting perspective. I think it's always interesting when you hear from the partner of a golfer, you know? So hearing from Stacy's husband, and also the fact that all the husbands are there, they were all hanging out together, I like that. Talking about the pod system that Julie Inkster has implemented, and the fact that it is the two Brittanys, Gerina, and Stacy all together, I mean, it's great for us at "Secret Golf" because our three girls are playing together in the same pod. Stacy and Gerina play together in 2015 in Germany, and by all accounts, they are a force to be reckoned with. I love the fact that Gerrod just came out and said that the nerds were hanging about together, because they are all very analytical, Gerina in particular. She has a math degree. She was a math major at college. So you can see why they have definitely been lumped together. And I cannot wait to see the results of this. So Friday is day one. The action gets underway with four foursome matches in the morning and four four-ball matches in the afternoon. Day two is the same format. And then on day three, 12 singles matches, a total of 28 matches played. And the US require 14 points to retain the cup. Whatever happens, it is going to be an action-packed weekend of golf. And I can't wait to see what the girls are going to do. Good luck, of course, to Stacy, Gerina, and Brittany Lang, I guess both Brittanys because they're playing in the same pod together. And a massive thank you to Gerrod for catching up with Elk on the phone live from the course. He said that the rain had been terrible. They were soaked. The girls had played 14 holes together, and then they'd come in. So yeah, hopefully we will hear from Gerrod again over the next few days. But keep checking back with "Secret Golf." And, of course, if we can speak to him about anything that's going on, this is where you're going to hear it. Thank you so much for listening, and don't forget to check out secretgolf.com. See you soon.